Three main trends emerge from the 2002-03 kidswear collections: style, technological improvements and patriotism. There is no mistaking the importance of style: faux fur trim for girls, a bold sporty or preppy look for boys, and stars and stripes everywhere. Fera, Jolly Kidz! and Cherry Tree all sport faux fur trim on their girls' jackets for the new season, and bold, classic colors define the boys groups. Collections are also more tailored to fit the specific needs of either boys or girls - their pieces are differentiated by a lot more than color! Burton Youth offers quilted insulated fabrics and an outerwear interface system that provides an allover seal. Phenix has concentrated on producing new materials that are more breathable, while retaining waterproofness. Spyder and Descente have also created new fabric and coating technologies that will offer the wearer complete warmth, dryness and comfort. Bold red, white and blue styling will also be seen all over the snow in 2002-3. Molehill is an official licensee for the U.S. Olympic Committee, so tots will be able to keep warm while sporting Olympic colors and styling. Spyder has long supplied the official outerwear to the U.S. Ski Team, and its Kyds' line lets the younger athletes have a chance to show their colors. Spyder's pieces not only sport the US Ski Team shield, but reflect current patriotic trends with a bold red, white and blue color scheme and "USA" embroidery. Burton Youth: No one puts more thought into snowboard gear and mountain wear than Burton. The company co-develops its soft goods line using young riders as consultants. For 2002-03, it is providing riding style as well as protection from wind, snow, and rain. Jackets are more tailored to suit the specific needs of young girls and boys. The all new Trinity Contour jacket for young girls is right in step with today's style. This jacket features an innovative removable, extendable helmet hood designed to move with the head; an outerwear interface system that allows the jacket to snap into matching Trinity pants to form a complete snow seal; an allover quilted insulation; fleece-lined pockets; pit zips; and an elasticized lip balm pocket. For boys, Burton offers the new P13 Contour jacket, a durable jacket with all of the features of the girl's Trinity Contour. Cherry Tree: Now under the ownership of Black Diamond Sportswear, Cherry Tree has a new designer who has developed an exciting collection of silhouettes, prints and fabrics. Most of the fleece pieces use Malden Mills' Polartec fabric, in both solid and printed versions. A new collection of solid pieces in a bright palette will be paired with the unique prints and jacquards developed just for Cherry Tree. There is a new fashion skiwear line with more technical fabrics suitable for harsh winter conditions. The highlights of this collection are innovative insulated outerwear for sports or casual wear; the new Ice Princess collection, featuring exclusive Glenoit fabrics; a high-fashion line featuring faux-fur trim; and an expanded collection of boys' fleece and outerwear for all age groups. Columbia: New for winter 2002-03 is Columbia's Omni-Shield group, which features Omni-Shield Rain-Stop fabric, a waterproof/breathable technology providing superior weather protection. Critical seam sealing is used for all seams exposed to water including the hood, neck, shoulders, back and arm seams on parkas and back rise and seat seams on pants. An Omni-Shield patch identifies each style. Other groups have technological or design improvements to carry them into the 2002-03 season. Columbia Sportswear has improved its fitting on all of its children's styles, with smaller shoulders (one inch smaller) and smaller hems (two inches shorter.) For girls, there are also fitted silhouettes that taper more at the waist than before. In color, blues, greens and grays are expected to be very strong for boys and purples, blues and greens are important for girls. The Youth line includes a wide range of hoods, including attached, detachable and pullouts. Columbia Sportswear also offers a wide variety of youth accessories, designed to coordinate with every category in colors that go with every parka. There is also a great collection of Youth Sportswear to coordinate with Outerwear. In the Core Youth Outerwear category, new pieces deliver clean styling and appealing color combinations. There are also new styles tailored more specifically to girls or boys. There are also more colors to choose from. Boys' Core is full of bright and outdoor tones, including a light gray that won't show the dirt. Girls' Core includes both bright and tonal hues. In the girls' Core group, a delphinium and bluet (an herb with blue flowers) replace hydro blue and the new Columbia Navy should meet or exceed the strong response of its midnight color line. A growth cuff has been added to the Granite Point Pant so now all Youth Core pants have growth cuffs. Couloir: Couloir strives to offer the best quality junior and children's outerwear at very competitive prices. Colors for 2002-03 focus on the traditional red, cobalt, navy and yellow and fresh new colors like flame, grime, grease and grass for boys and orchid, hibiscus, buttercup and lilac for girls. New styles include relaxed bombers, instructor length and relaxed-fitting mid-hip styles. Highlights include the Junior Freeride collections for both boys and girls and a junior girls' Metropolis group. Couloir also has a selection of coordinating fleece tops, gloves, mitts and headwear. Descente: Descente's junior collection incorporates freeride styling with a new fabric, called Junior OX. This innovative fabric is windproof, lightweight, noiseless and offers 10,000 mm of water resistance (enough to keep any kid dry in most wet conditions.) Junior OX offers the look and feel of cotton twill in a multi-function performance fabric, giving the line a more relaxed and urban look. Many of the jackets in the collection are replicas of adult Performance Sport and DNA jackets and include many of the same great technical features such as removable powder skirts and critical seam seals. All jackets and pants in the Junior collection are unisex in styling, but color palettes are geared specifically to girls with pansy and lavender, or to boys, with dark red, navy and charcoal. Fera: Fera has created its biggest line ever for juniors and kids, with four distinct collections for little girls, little boys, junior girls and junior boys. The little girls collection is notable for its bright crayon colors (such as peppermint, cantaloupe and fuchsia) and playful details. Styles include the Mush parka with faux fur collar and embroidered trim, and the Princess, with floral braid highlights. The Carver collection for little boys carries a racing theme, with bold primary colors and sporty stripes. The new Racer jacket features a checkered flag trim. The Flirt collection offers a wide selection for the junior girls' market, featuring a hip, new look. Inspired by ready-to-wear fashion, this line incorporates stud trim, quilting, floral braiding and new colors like lime fizz and butter. Other influences are the sophisticated designs borrowed from Fera's women's line, producing faux fur trim and rich detailing. The Bamboo collection for junior boys moves away from the drab colors of past seasons toward brighter alpine colors and distinctive European lines. Boys will love the cool technical details like stowable hoods, powder skirts and pockets galore on every style. Across the four collections, Fera is capitalizing on its expertise in pants to offer additional styles for boys and girls that can either be matched to Fera jackets or look great individually. Jolly Tundra/Jolly Kidz! 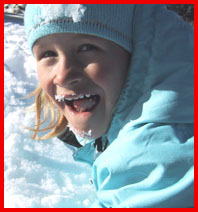 When the kids head for the snow this winter, they'll be warm and comfortable in Jolly Kidz! stylish, functional pieces. The 2002-03 line uses a technical pile fabric with exclusive patterns; it looks like wool flannel but it is made with polyester/acrylic microfibers. The girls' snowflake print is trimmed with fashionable faux fur and little boys will love the stallion print trimmed in red plaid. Outerwear is sized infant through 14-16. Styles include jackets, vests and baby bunting pieces with matching hats and mittens. Meister: Classic is the word for 2002-03 at Meister. All the Meister lines will feature elegant, traditional styles and underscore the timeless appeal of the classic ski sweater. Designs for little girls and junior girls include a traditional primary color palette and "girlish" touches like knitted daisies and embroidered trims. Designs for boys are characterized by a sporty preppiness reinforced by bright stripes and colors. Finally, recognizing the spirit of freedom captured by skiing and symbolized by the American flag, Meister offers a handful of styles adorned with the stars and stripes. Molehill: As a licensee of children's fleecewear for the United States Olympic Committee, Molehill offers a new line that captures the spirit of the Olympics for winter 2002-03. The pieces in this group will mirror the look of U.S. athletes as they march in the Opening Ceremonies and will incorporate updates of their proven style. Pieces include Hooded Jackets, Fleece Vests, Polar Pants, Tree Hugger Hoodies and Bunting Bear Suits. Phenix: Phenix' 2002-03 groups build on its racing heritage while moving it into the freeride arena. In the kids' collections, jacket and pant combos that emulate the classic looking, tech-laden Proline II adult series are designed for all-day comfort. With a pull of hidden drawstrings, sleeves and pants in the patented Suku Suku line can provide up to eight full inches of extra growth, but can shrink back down so it can be handed down. New base layer and T-neck tops use Outlast temperature regulation technology in combination with Phenix's own "warm and dry" properties, in a three-layer knit construction to create extraordinary performance. The fabric is brushed on the inside for softness against the skin and treated with an antimicrobial to control odor. Sport Obermeyer: Sport Obermeyer offers a wide selection of clothing for kids of all ages. The collections for young toddlers are a specialty. For 2002-03, there are three preschool groups, Alt 2, Obercross and Kaleidoscope. The Obercross group has a motorcross-inspired racy look for young boys. The Kaleidoscope group, for little girls, is a sophisticated yet sweet mix of prints and cozy faux-fur trimmed hoods . Alt 2, for both boys and girls, is a sporty versatile group. The "Preschool Only" design features Obermeyer's fleece chest protector, a mock vest built into some jackets, a chin-high collar and an easy-to-operate centerfront closure that will keep warmth in, even if the jacket is left open. The collection also features elasticized safety hoods that can be tied down or zipped off. Spyder Kyds: Little ones need their clothes to be just as warm, waterproof and durable as adults do and Spyder's 2002-03 Kyds collections ensure that they are. For juniors, styles echo the adult categories-Authentic, Legend, Quest and Venom, while the toddler collections-Itsy Bitsy and Mini Moe-are completely individual. The Kyd's USST Jacket is built as a serious jacket for future Olympic hopefuls. Thinsulate insulation paired with XT waterproof coating and Spylon water repellent finish keep the wearer warm and dry. Critical seams are taped. Design features include a powder skirt with logo jacquard gripper elastic, a rollaway hood and an internal draw cord at the hem. For safety and convenience, the Kyd's USST Jacket offers an internal multi-communications device pocket for two-way radios and beacons. The official U.S. Ski Team shield and USA embroidery adds to this jacket's visual appeal. A bold red, white and blue color scheme keeps this jacket in the forefront of current fashion. Trespass USA: The Trespass Junior category carries a hot technical look, at very reasonable prices. Trespass has made a selection from its International line for junior garments (for kids from two to 16) that are scaled down versions of their adult collections. Pieces use a micro-technical fabric that not only provides protection, but also gives the garment a great tech look. The high performance Radium line features such elements as snowcuffs, high collar, zip pits and equipment pockets, with style that's second to none. "This is a crossover garment, incorporating snowboard and freeride influences in its styling for broad appeal," comments Henri Patty, director of sales and marketing, at Trespass USA.